Julia Barretto and Joshua Garcia earned praises for their respective performances in Saturday's (February 18) episode of 'Maalaala Mo Kaya.' Julia’s mother Marjorie Barretto couldn’t help but be proud of her daughter. She shared a heavy scene of Julia on Instagram and shared that Julia wanted her to be proud of her. 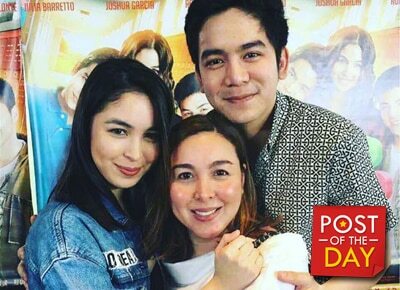 “When Julia was taping for this, she would tell me that I really needed to watch this episode, sabi niya, ginagalingan niya, para maging proud ako sa kanya,” she shared. Please allow me to share my favorite scene sa #MMKLoveMeNow. When Julia was taping for this, she would tell me that I really needed to watch this episode, sabi Nya, ginagalingan Nya, para maging proud ako sa kanya. She told me last Valentine's day, that she was dedicating this episode to me. I told her I was always proud of her naman. But when I watched you here Juls, I was overwhelmed. To see you evolve. To see how you used all your pain and made yourself a better person for it. I felt you.. and I felt Aika's pain. And I want you and the world to know that I am proud of you?? I have always believed that with God's grace and your hard work you will be the best that you can be. Mahal na mahal kita? ?